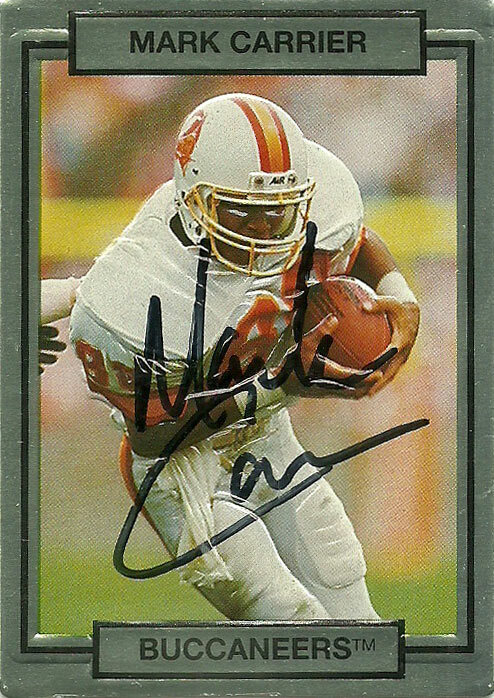 The Buccaneers drafted Mark Carrier out of Nicholls State at the top of the 3rd round, to pair him up with overall #1 pick Vinny Testaverde in 1987. 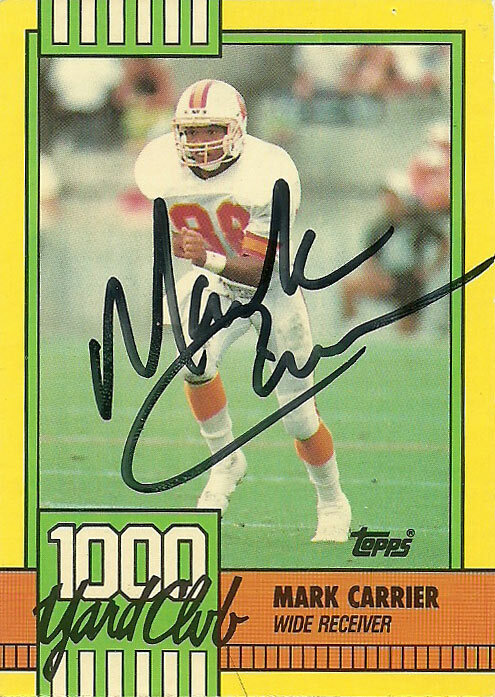 A solid pickup by Tampa, Carrier would start hitting his stride by 1988, making 57 receptions for 970 yards and 5 touchdowns. He’d follow up his sophomore campaign with career highs across the board, with 86 receptions for 1422 yards and 9 touchdowns. 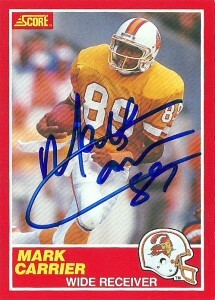 Mark would be named to the ProBowl and All Pro after the 1989 season. 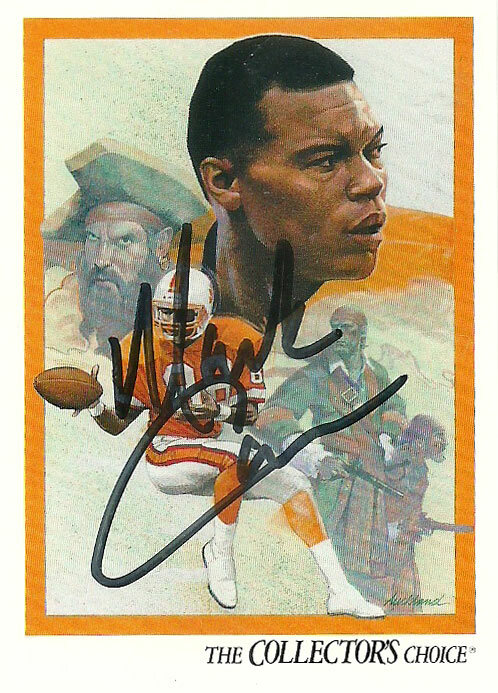 He’d continue to play for the Buccaneers through 1992, and then join Vinny Testaverde in Cleveland via free agency in 1993. As of 2011, he remains the franchise’s all-time leader in career receiving yardage with 5,018. At the conclusion of the 1994 season, Carrier would be drafted by the Carolina Panthers in their expansion draft with the 32nd pick. He’d begin anew in Carolina, making 66 receptions for 1002 yards and 3 touchdowns for the Panthers in the 1995 season paired up with Steve Beuerlein. 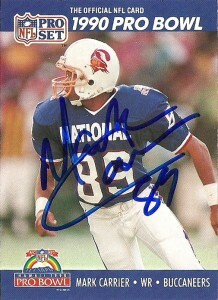 Mark would follow this up with a 58 reception season for 808 yards, however by 1997 injuries would begin to limit his playing time, and after starting only 1 game over the 1998 season, Mark would retire. 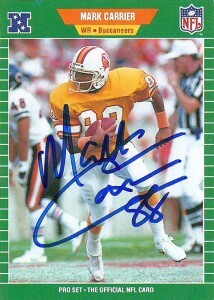 Mark is a voracious TTM signer and is currently enjoys coaching Pee Wee football in the Tampa area. 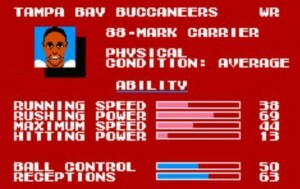 He also appeared in Tecmo Super Bowl for the Buccanneers, and in Tecmo Super Bowl III Final Edition for the Carolina Panthers. 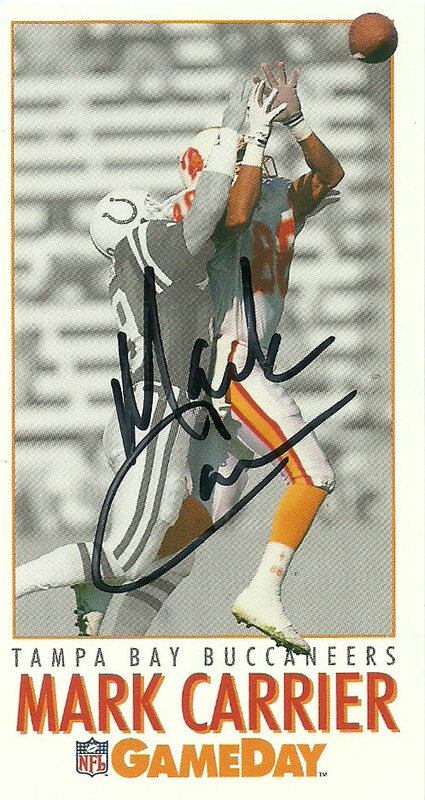 Mark (wide receiver, 1987 draft) is not to be confused with the defensive back by the same name drafted by the Chicago Bears drafted in 1990.